This program is a fantastic option for just about any dog! 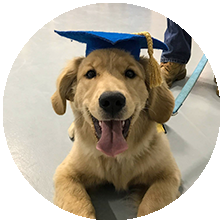 Whether you are looking to get training started off on the right paw with a new puppy, have a dog that needs intense focus on a certain area, or simply want to take your dog’s training to the next level – leave it in our hands! Your dog will board in the area’s finest dog hotel and spend each day training with our trainers. In addition, you can schedule playtimes and relaxing massages during your dog’s stay. It’s like a health spa! Owners will need to speak with us about training goals in advance. Training records will be given at the end, and owners must attend a mandatory Private Lesson before taking their dog home. A minimum of two weeks is required, and additional weeks can be purchased if desired. The length of stay will vary depending on your desired goals and the ability of the dog.